As required by Section 123 of the Dodd-Frank financial reform legislation, Treasury Secretary Tim Geithner, as chair of the Financial Stability Oversight Council (FSOC), has released an assessment on the costs and benefits of potentially limiting the size of banks and other financial institutions. This report, four-and-a-half pages in a longer “Study of the Effects of Size and Complexity of Financial Institutions on Capital Market Efficiency and Economic Growth”, is represented as a survey of the relevant evidence that should guide policy thinking on this issue. This is an analytically weak report that presents a skewed and incomplete assessment of the evidence. Given that the paper was prepared by some of the country’s top experts, who are well aware of the facts, the only reasonable inference is that our leading relevant officials prefer not to take the Dodd-Frank Act seriously with regard to reducing systemic risk. Instead, on all major points, the Financial Stability Oversight Council is allowing the big banks to prevail – and to pursue whatever global expansion plans they see fit. Given Treasury’s attitude during the financial reform debate of 2009-10, this is not entirely surprising. Still there are three major issues with the substance report that should be considered particularly embarrassing to Mr. Geithner and his colleagues. First, on whether large banks benefit the broader economy, the authors neglect to mention even the most basic facts regarding the increase in the size of our largest banks in recent years. As a result, the entire discussion of bank size in this report reads as it is completely divorced from current economic and political realities. The assets of Chase Manhattan in 1995 amounted to 4.1 percent of GDP. The assets of JP Morgan Chase, as measured officially, were 14.5 percent of GDP in 2010; if we included their off-balance sheet assets (including derivatives), this total would be substantially higher. There has been a similar increase in all the Big Six Banks. The balance sheet of Goldman Sachs, for example, increased from 1.3 percent of GDP in 1995 to around 6.2 percent of GDP at the end of last year (based on this week’s report); by the firm’s measure, assets expanded 7 percent from the end of 2009 to the end of 2010. The central issue with regard to size that should be before the FSOC is not the presence or absence of economies of scale in banking generally, i.e., whether a bank becomes more efficient as it increases from, say, $100m to $100bn in total assets. The pressing policy priority is how to assess what has happened to efficiency within our very largest banks – and the precise way that has benefited the broader economy (or not). Second, the report’s survey of the empirical literature is highly selective to say the least, ignoring – for example – almost all of the research we cite in 13 Bankers. It also fails to mention the 2007 Geneva Report, “International Financial Stability,” co-authored by former Federal Reserve vice chair Roger Ferguson, which found that banking consolidation had not led to efficiency gains, economies of scale (at least above a low threshold), or economies of scope. The report places a great deal of weight instead on a single unpublished working paper from the St. Louis Fed, by David Wheelock and Paul Wilson. This is an interesting paper by serious researchers, and one that we placed in the context of the literature on p.212 of 13 Bankers (see also footnote 69 on p.272; all page numbers refer to the hard cover edition.) But this paper is based on a very particular econometric specification, i.e., a way of writing down the equations that put structure on the data that is far from convincing. In particular, it is hard – perhaps impossible – in their framework to determine the “true” efficiency of banks, compared with the effects of various kinds of government subsidies implicit in being “too big to fail” and therefore having cheaper access to funding. Basing banking policy on data from just part of any credit cycle is unwise, to say the least (and not at all what the authors of these underlying papers are recommending). And it is very strange that responsible officials would think we should draw any relevant inference for our current situation by cutting off the information in the mid-2000s, i.e., before the crisis and without the ability to reassess who made and who lost what kind of money (and how government bailouts affect the relevant statistics). This is akin to saying, “let’s pretend there was no financial crisis in 2008-09.” It makes no sense, unless you wish to view today’s megabanks in the most favorable possible light. Third, the FSOC is completely ignoring the important work done at the Bank of England on bank size, “too big to fail,” and closely related issues. For example, nowhere in the longer report do they cite the work of Andrew Haldane and his colleagues who have financial stability responsibilities in the UK. The October speech by Mervyn King, governor of the Bank of England, is also a glaring omission – see my NYT Economix column last week for the details. And it is simply shocking that the longer report nowhere cites the definitive work of Anat Admati, Peter M. DeMarzo, Martin R. Hellwig, and Paul Pfleiderer on the need to greatly increase equity in the banking system, i.e., reduce leverage (debt relative to equity) through much higher capital requirements, because this is an essentially zero cost way to make financial intermediation safer. This is central to the broader discussion of size and complexity, because it speaks directly to the issue of whether banks’ buffers against losses are likely to prove adequate as we move forward. There is a pattern of official behavior here. Central banks in other industrialized countries are at least beginning to confront the ideology that supports the unfettered and undercapitalized growth big banks. In contrast, the Treasury, the Federal Reserve, and now the FSOC are distorting the evidence to accommodate the views of Jamie Dimon, Bill Daley, and other executives who want to build bigger, increasingly global, highly leveraged, and much more dangerous banks. An edited version of this post appeared this morning on the NYT.com’s Economix blog; it is used here with permission. If you would like to republish the entire column, please contact the New York Times. Sir, Anat Admati asks for higher equity requirements for banks “Force banks to put America´s first”, January 20. She is correct about that goal but wring about how to reach it. The reason why banks have too little capital is not that the basic capital requirements are low; but that the arbitrary risk-weights which the regulators playing risk-managers assign to those risks perceived as low are obnoxiously low… especially when considering that it is precisely what is considered to have a low risk which poses the highest systemic risk. A society will not disappear because of the risk their children will turn all into risky bungee jumpers, but it could disappear because of the risk that they all pick the wrong subject to specialize in at the risk-free university. The basic capital requirement under Basel II was 8 percent… but the risk-weight for lending to Irish banks or Greece, for instance, was only 20% which effectively diluted the previous decent 8 percent to an indecent 1.6 percent. I thought about not commenting at all to this very biased post by Dr Johnson,( who seems to be on a crusade and who does not show the judgment compatible with a position at an institutiopn like Harvard) but maybe I should at least agree with you. This is not a very good post: (1) you do not have the operating expertise to make judgments on an industry that is far more complicated than most academics realize (2) we are past the point where revolutionary change (as you prescribe implicitly) is feasible and not too risky. The financial system is too fragile for cheap shots from people who, for most of us, ought to know better. Why blame the banks because the duly elected politicians decided to bail them out? Why blame the banks for craving unlimited wealth and power? Obviously, in the United States it is perfectly legal for special interests to lobby politicians for favorable treatment in laws and regulations. Until the standard operating procedures change, every lobby/special interest is entitled to push through their respective agendas. So much unnecessary whining about bankers, Wall Street, the demise fo the middle-class, etc. Let’s choose our battles wisely. If corporations had no way of bribing government officials through campaign donations, cushy jobs after “govt service”, etc., then reforms could occur. It’s good to know what should be done, but it’s a little academic until the bribery problem is solved. Then again, why blame the politicians for taking the money? They’re only persons, after all, and everyone knows they’re not out best and brightest. Who is kidding who? The only reason risk-weighting came about in first place was to increase leverage and therefore debt. You can’t increase the capital requirements because the banks would have to liquidate assets and unwind derivatives positions and you know where that would take you. Excessive debt is the problem around the world in all kinds of institutions. Mr. Johnson and Mr. Kwak do not have to have “operating experience” to make judgements. If they did, they would be banksters out of the industry and part of the problem. Mr. Johnson has seen soverigns fail before in his IMF position. What they have been doing on this blog for months and in their book is warning you of highly unstable economic conditions. You can stick your head in the sand but discerning people are trusting their judgments. Wow, these are insane numbers. One thing that occurs to me to fight the girth of these monsters is to create Fed- and Treasury-backed programs that encourage more smaller, local banks who can operate more nimbly and therefore, more competitively than the mega banks. What’s more, said Fed and Treasury can actually be preferential in their fed-funds window to smaller, local banks. Then, over time, with far fewer net deposits in the mega banks, combined with enforced net capital rules, the mega banks will naturally have to lower their activities that equate to systemic risk. Of course, such a proposal would require a Fed chairman and Treasury secretary who weren’t addicted to the taste of abnormally large and influential banker appendages. NEGATIVE BALANCE. What kind of accounting is this. But it is indeed true that we have the best politicians money can buy. “Henry Kissenger opens up the Chinese Markets under Nixon – Nixon decommissions the Bretton (1944) Woods Act in 1971 and takes the United States off the “Gold Standard” making “U.S. Funny-Money” the world’s hegemony of choice!
. . . too fragile for cheap shots . . .
– In what ways is the financial system too fragile? – Who caused the system to be so fragile? – What harm, exactly, might all this loose talk cause? And maybe you could also suggest other social and economic area that would benefit from restricting our freedom of speech. Lastly, let me applaud you for speaking out. So many people don’t realize how helpful it would be if they would just STFU. Actually, what I meant was programs that encourage the CREATIONS of NEW, smaller local banks formed from private capital. I have no love lost for the smaller banks that have run themselves into the ground from reckless lending practices. They deserve to fail as much as the mega banks. Massively wonderful article, Simon. I would say that they various conclusions are highly predictable. That is, they seem to have nearly perfect alignment with the contibutions made to our government’s elected and appointed officials over the past several election cycles which have recently crescendoed. After all, as you penned this piece, I am virtually certain that, between the lines, you were seathing with anger and outrage. You yourself have pointed out, on more than one occasion, that America’s power structure has come to closely resemble that which denotes third world plutocracy. That is what we have become. We don’t have the political structure to appoint someone with Mervyn King’s forthrightness to Tim Geithner’s job. We only have appointees who “appropriately” obfuscate when delivering justifications on the status quo. That is now who we are. Aren’t you happy to have obtained citizenship in this massive banana republic? Maybe you ought to reconsider. That has been happening ever since HAMP was proliferated. Jeff, the deleveraging will happen, sooner or later. The question is when. It could have happened during the crisis, and we could be in full flight recovery now. As it is, deleveraging is the can that is continually punted down the road. The longer it gets kicked, the higher the price when the deleveraging occurs. The house of cards now exceeds the height of the Petronas Towers, and its cost will be far greater than the toll 9/11 has taken on this country’s soul. My view is that when the day of reckoning occurs, it will be such a catastrophe that the Great Depression will look like a minor economic bump in the road. You are right about those ratios. The way I look at it, the Congress and FED have plowed trillions to prop up these TBTF criminals, and that was our penalty AFTER they cost the eoonomy more than 30 trillion in damage. What a deal. It’s like, I go rob a bank, and the judge says, don’t worry, we’ll give you a bonus for that, so go tell your friends and they can do this and we’ll do the same for them. Meanwhile, we can’t get funding sufficient for DOJ to investigate what’s really behind the foreclosure schemes. So, go sell some overpriced mortages, some junk bonds called AAA, and then lose all the paperwork. Don’t worry, sooner or later the Supremes will bail you out. Very high priced lawyers are like magicians. They can make silk purses out of sows ears. At the end of your comment, you say “for most of us….” Who is us. I am not us, for sure. So us must be a part of the Wizard’s team behind the curtain. Who else would write such a thing. It is not necessary to have “operating experience” to have a cogent opinion. In fact, if you are a part of the problem and have such experience, your opinion could not possibly be objective in the least. As you well know, Simon’s credentials are impeccable, and, to my knowledge, he has no political agenda (relating to American politics) other than a desire for our political leadership to act rationally. I suspect that he’s trying to gore your bull, and his rationale is close enough to accurate that you are afraid of it. I pity you. This is a nice post. I am a new member of this site and I am excited to share to anyone this upcoming event. T. Harv Eker, Ryan Lee, Randy Garn, Brian Tracy, Barbara de Angelis, Jim Kwik, Brad Wozny, Gary Spirer etc. I am not sticking my head in the sand at all. This is a very dangerous industry and the US financial system has very important weaknesses, one of those being very bad regulation. But the changes that are being ridiculed here are truly improvements and will make it harder for even Chase and Goldman to get themselves in trouble (and let’s face it, they did not get in trouble, they benefited from the other banks’ trouble and thus indirectly that those other banks were not liquidated like Lehman. Are these improvements enough? I do not think so. Are James and Simon qualified to determine that , say JPM and Goldman (why not BoA and Wells?) should be broken up or shrunk? I do not hink so. If they did, they might present a more detailed image of the system that would be preferable, why it would be so and how to get from A to B (including the politics and the international dimension. And I certainly do not believe that the international dimension of these banks makes them riskier, on the contrary. Wells is probably a lot more risky. Why: its shareholders and managers are exposed to a much less diversified portfolio; its strategy aims squarely at creating unusually high (hence possibly inappropriately dominant) market shares. That may reduce welfare and also lead to a situation that small changes in lending policy resulting from risk management shifts could have financial crisis-like effects at the micro level, or that they might see that they have gone too far (neglected to look at the effects of their own activity on the house values) and then gamble for survival. Anyway do not construe my comments as suggesting that because I consider the critics here mostly ill informed (or having their own agendas) and get too much into wishful thinking, the current situation is ideal. It clearly is not and there are better ways to regulate, that may be even better for both consumers and shareholders (but not for management and staff) and maybe even for business clients. However, these have not played any role in the political debate (elsewhere they have, but that is partly due to the non-US tradition of tenured senior civil servants detached from politics that is still alive in certain countries). Given the homogeneity of the US economy, efficient banks would tend to be very large (as they are in Europe and Japan) efficient market shares would be over 10%. That was predicted when interstate banking was liberalized and it may even be on the low side. Much of that market share would not be reflected in the balance sheet (assets) because whereas a very large retail-focused bank like Wells derives much of its revenue from “banking”, Goldman on the other end of the spectrum derives most of its revenue from a wide variety of fees and trading profits and is the premier corporate financial services franchise in the US. In both cases funding plays an important role, but in terms of businesses these banks are almost complementary, rather than competing with each other. Yet another set of activities are transaction processing ones. The specialists in that business (with very high global market shares) do not have to have very large balance sheets at all. What is truly risky is a combination of businesses under one roof that is too complex for management, regulators and risk managers, and also very large and very international. Those banks are likely to get very special treatment under the new rules and so they should be. However, what I would expect is that the equity markets will, more than in the past, look at the underlying businesses. For a long time, the pre-Citigroup (before the merger with Travelers/Salomon) was considered a business where the parts were worth more separately than together. 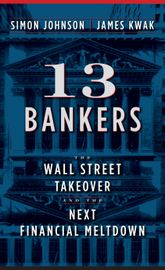 However the entrenched Citi managers were saved by the merger with Travelers (well not quite) and the market never got a shot at Citi’s transactional businesses its consumer bank or its great overseas businesses.The business that resulted from this merger was never able to exploit the synergies that were theoretically available. Why, because of basic flaws in the underlying business models, incompatible cultures and comsensation systems. JPM may have a better handle on this, and Goldman is unlikely to branch out into Wells territory. The ones to worry about seem to be BoA and Citi. So what the regulators should do is to signal more to the equity markets what they like and what not. That has never been done before (or only when it was too late). I hope that the above illustrates the complexity of the whole thing. And there is no way anyone can start with a clean sheet. That would have been possible if the US had simply nationalized all those banks and after clean-up released them to the market in pieces. Inventing new straitjackets for the incumbent megabanks is pointless. They would probably sabotage the political process and even gain, or adapt and go around these hurdles..
My apologies for using “us” and no one is going to gore my ox. I always thought that goring is what oxes (and probably bulls too) do..
O, and I am no longer part of the problem either. But trust me, if the academic wizards were put in a position where they had to actually redesign the system, they would find it quite a bit harder than just rant and do populist mobilizing. Why do they do that I? Pride? Altruism? Advancement? Book sales? I have no idea. Simon can say what he likes, but if people look at his CV and then think that this is the gospel, that should make him a little more careful about making suggestions that are not quite relevant (like large bank assets: what is the significance of that in this environment) and coming up with nothing that is practical. I could fix the traffic on the Chicago expressways, but maybe you would not like what you would get.. It is completely obvious, that you are totally unprepaird for the soft economy which awaites you and perhaps your clients. An inability to explain to others the physics of such an economy and how it can operate, will bring frustration of the type I sense in your posts. You may not like the redesign, but you can not just turn red, get mad, and walk in the other direction. Not of course without a law suit. Again, possibly in your world, but do not complain when it turns out that “everyone here” does not agree with your type. Goldman Sachs (radio-active gov’t?) could cares less about Wells (Wachovia/rainmaker), but is terrified by Morgan Stanley now eating their lunch. “BoA will be just fine when BlackRock Inc. deal (incl.PNC) is done. Cutting off the left hand pinky of ML’s trading desk won’t be a drag on BoA’s, BS. They would probably sabotage the political process and even gain, or adapt and go around these hurdles..
Simon recognizes that Bank size is a proxy for Bank political power. That political power allows Banks to capture regulators and to grow ever bigger – increasing systemic risks. You seem to recognize this, but criticize Simon for speaking out and trot out the BS arguments that banks have used to their advantage: “market efficiency” to justify ever increasing bank size, and warnings of a “fragile financial system” to silence critics and justify bailouts and weak regulation. Just how do you think you are helping? So what the regulators should do is to signal more to the equity markets what they like and what not. Do you seriously think the Banks in will allow this? International banks buy the politicians and play the regulators off each other. Simon has referred to the ever larger booms and busts that result from a bank-captured political system as a “doom loop.” If you think that that can be addressed with some technical changes, you are deluding yourself or (as a financial executive) part of the problem. The term TBTF begs the question. It challenges anyone who critiques it with a consequence of such failure and burdens them with an aggregate responsibility accumulated by the very consolidation itself. In effect, it says leave us alone or take all the blame. No politician (even non-crony) is going to risk that upon themselves so the pressure/leverage to concede and conform (rather than reform) is formidable. Without a working plan for de-consolidating the status quo and a fundamental consensus…the political slant is going to follow the money (even without consideration…or insider collusion of the “commissions” bought…oh excuse me…brought into ad hoc active play from within the ranks of the sovereign baking interests). The lock step with Too Big to Fail is unfortunate. It should be presuppositioned as Too Fat To Curtail. Where is the great American middle class banking models of correction that would be in their own interest. Where is the voice of America? Where are the commercial bankers from middle America and the co-operatives that might lend some weight to alternative modeling. consolidation is only good up to a point of efficiency and effectiveness but eventually destroys competitive context by destroying its competition. At what point does competitive advantage become perverse advantage and at what point does moral hazard become power acquisition and the self preservation of control fraud? At what point do we watch entire nations falling like dominoes and still stand by while we tell naive new targets to just open their borders and let it all happen to them? And for what? We are toppling whole economies under the stupidity of single entities being Too Big To Fail! BRAVE NEW WORLD…INDEED ! This indeed is the middle ground and the critical pivot to it all. I respect your optimism but your balance should be tapered to some degree skepticism about the value of maintaining such entities at the zero sum cost effectiveness it has attained. I thought your post was well presented; and does honestly set a platform for consideration and discussion. Hypothetically speaking, would would you say could be the alternatives if we could set up a more diversified and decentralized process to serve the economy and the country towards a better capitalization of our future? It is all to common to hear the same old…just do more of it and we will get it right…Trust me…you’ll see! I don’t think educated people are buying that anymore. So how would you propose it “might” be done? And I welcome me,myself, and I, among your newly formed team. Any character at my disposal I will use toward your benifit and behalf. None to be unturned, I promise you that. WikiLeaks, the Internet and Democracy: very compelling! which ends this very intelligent panel discussion. “STASI” correction “post WWII” East Germany 1950: see article for details of that Organization. Ellsberg’s warnings are for a “United Stazi of America” emerging from the data base of OUR corporate and social internet information. (Perhaps Not too far of a stretch from the logic behind TBTF and the analogy of its having a monopoly over our money supply). And even more to the point, small banks should only be allowed to fail once. Prroooping up banks that continueally have to visit the interest free Fed window to stay afloat, when ever they feel the need, is sort of foolish. They should be allowed to fail and their ashes left right where they stand. Britain’s high-street banks may be broken up to protect taxpayers from future collapses, under radical plans being considered by the Independent Commission on Banking. Sir John Vickers, chairman of the ICB, yesterday gave the clearest sign yet that the commission could recommend to the Government a fundamental reform of the UK’s high-street banks, including the option of splitting their retail and investment banking divisions. This was addressed to Rien Huizer’s comment above. Twitter was willing to challenge a grand jury subpoena, but it is unlikely the same can be said about Google and Facebook. Now, Rien, you’ve drifted in ad hominem attacks and undermined your own credibility! Operating expertise…really. You sound like a banker. I would know I am one. What expertise are you referring to… The “science” of money is relatively new, compared to gravity that was here before we were. Gravity has no greed, people do. The expertise of money will always have a bias of greed. I believe the point is that the market/system is more complicated than academics realize. THAT’S the problem. It needs to be boring banking. Not so complex no one understands. But the real question is do they even need to understand. With no incentive to be conservative. Why would you care. Reminds me of my old sales manager and my mortgage days. Just as prime started to move up past 5% in 2005. We knew the good times were coming to a end. Prime kept moving up. Our sales manager: Don’t think about the future, make as much money as you can now. That’s why wall street coined IBGYBG. I’ll be gone you’ll be gone. Operating Expertise is for the losers. Real banksters act with no limits or bounds.